Capstan-style winches are unique in that they don't store line on their drum. 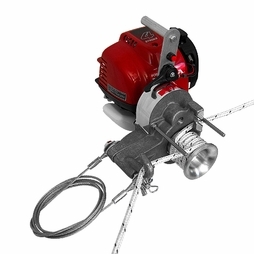 Unlike a conventional winch, capstan-style winches pass rope around a rotating cylinder. They work by simply maintaining a few wraps on the drum and some back tension while the rest of the line is passed through. This means you can, in theory, pull an unlimited distance (however long your rope is). 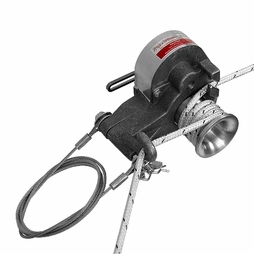 One of the best-known models out there is the Simpson Capstan Rope Winch. We've been selling them for years with many solid reviews to vouch for their performance. They are popular with hunters, off-road enthusiasts, tower workers and general contractors. Because they are so portable, they really can be used just about anywhere. You have two choices: the CS-38 model which is powered by a chainsaw, or the SP-CW model which is self-powered by a new Honda 4 Stroke OHC gas engine. We think both models perform extremely well and that you'll be happy with either one, just like the rest of our customers. Aside from their great track record for performance, we think one reason they sell so well is their simple usability. Find an anchor point, connect your rope, wrap it around the drum and that's it! 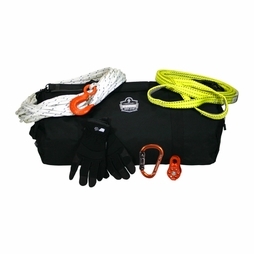 And, to help you get the most out of your capstan winch, check our Capstan Rope Winch Accessory Kit. It's packed with all the right tools for field use and allows you to double your line pull and performs redirects with ease.